All patients can join the tAccess Support Program. †Patients must meet eligibility requirements. Savings will apply after patients pay their first $10 per 30-day prescription or their first $30 per 90-day prescription. Maximum savings are $100 per 30-day prescription or $300 per 90-day prescription. 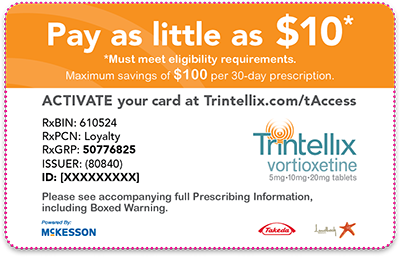 This offer is valid for 12 months of prescriptions.